Here’s what you need for comfort season cooking. 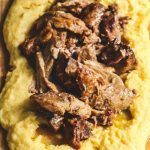 This slow roasted Italian pork with polenta is so easy to put together and makes the most ultimate winter meal! It’s not how I intended to make this pork. It was supposed to keep cooking until it was ready to be pulled apart for some fun pulled pork sandwiches. 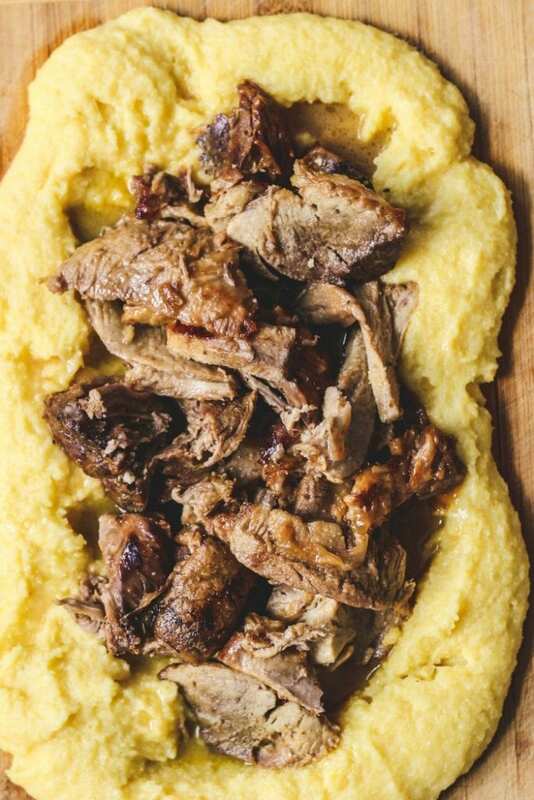 But when your Italian husband is home and he’s from the land of POLENTA in Lombardy, Italy, you will get pork and polenta. And maybe some leftover pork for sandwiches. I’m not opposed to his creative take. Did I mention pork and POLENTA. Oh, my. If you have never had this combo before…It’s a must try and a must eat, and I mean ASAP. Seriously, not the meal to have if you’re trying to have just salads every day for dinner as you start off in a clean way. But if you are looking for comfort and flavor in every bite. and also no fuss, this is the meal for you! All you have to do the day before is season your pork and leave it in a plastic zip bag or plastic container to marinate overnight in the fridge. The next morning (if you’re making for lunch like we did), place it in the oven on a foil lined roasting pan. Add a sliced onion to the pan and some water and cover with foil. Let it cook and do its thing. When it’s almost ready, you make the polenta. If you still want that salad, serve it on the side! !For the gluten-free readers out there, this is totally gluten-free and totally delicious!!! some notes on this recipe:If you have the time to make this in your oven, the pork will come out fantastic. If you have a slow cooker or an InstaPot, feel free to follow the directions for your cookers and use them. I know in the slow cooker it should take about 7-8 hours. Just brown the meat and saute’ the onions before popping it all in the slow cooker. 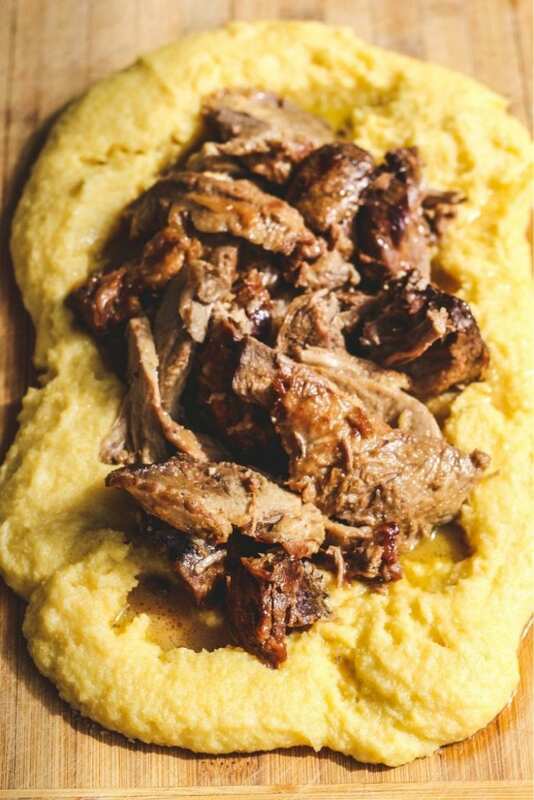 Slow Roasted Pork with Polenta is easy to put together and is the perfect dish to enjoy on a cold night. Total comfort food in every bite. Serve it with your favorite side vegetables for the ultimate winter's meal! Rub the pork with 1 Tablespoon salt and pepper, a teaspoon of paprika, and one of the smashed garlic cloves. Place in a plastic zip bag or plastic storage container. Store in the fridge overnight or a for a few hours before cooking. Preheat oven to 300 degrees. Using a sharp knife, score fat (but not meat) on pork in a diamond pattern. Pulse herbs and the rest of the garlic in a food processor until combined. Slowly add oil and continue pulsing until a thick paste forms. Stir in 1 Tablespoons salt, 1 Tablespoon pepper; rub mixture all over pork. Place the onion slices in a foil lined roasting pan or large Dutch oven. Place pork, fat-side up, on top of the onion halves; add 1 1/2 cups water to bottom of the pan. Drizzle a little bit of olive oil (about 1 Tablespoon) on top of the pork. Cover with foil or lid (if in a Dutch oven) and roast until meat is starting to become tender, about 3 hours. Remove foil or lid and continue cooking until meat is fork-tender, 1 to 1 1/2 hours more. Cook 30 minutes per pound total, or until the internal temperature as measured with a meat thermoter is 160 F. Remove pork from the oven and allow to rest 15 minutes before pulling apart or cutting. Carefully transfer pork to a large bowl, leaving juices in pan. When cool enough to handle, use two forks to shred meat into bite-size pieces, discarding any large pieces of fat. Transfer shredded pork back to pot and toss with juices. If you prefer to serve in larger pieces as we did, transfer to a cutting board and slice your pork into desired thickness. 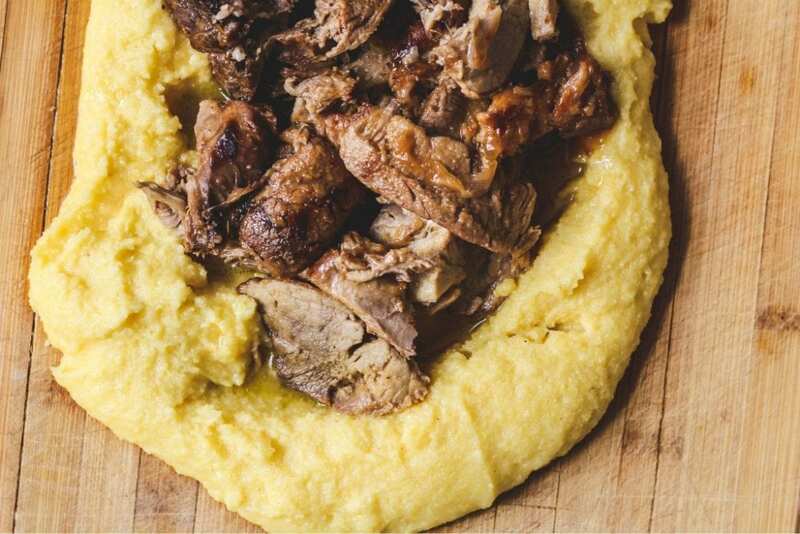 Make the polenta while the pork is on the last 30 minutes of cooking. Bring 3 cups water to a boil in a heavy large saucepan. Add 1 teaspoon of salt. Gradually whisk in the cornmeal. Reduce the heat to low and cook until the mixture thickens (about 30 minutes) and the cornmeal is tender, stirring often and making sure to scrape the bottom of the pan. Remove the polenta from the heat when it is tender and creamy and has reached your desired thickness. Turn off the heat. Add the butter, and stir until melted. Stir in the Parmegiano Reggiano (add more or less to your liking). If not serving immediately, reduce heat to lowest setting, cover pot, and keep warm until ready to serve (up to 1 hour). When ready to serve, spread the pork on a serving plate or clean cutting board. Place the pork and the juices in the middle. This looks so delicious! 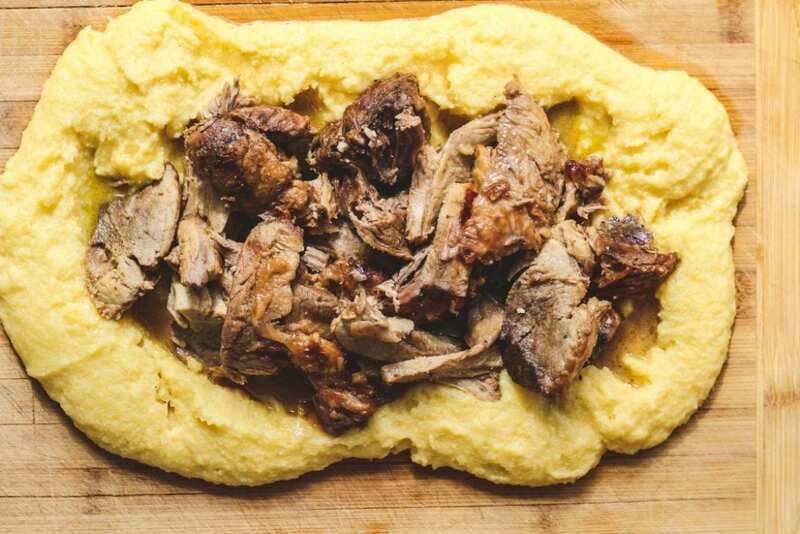 My husband introduced me to polenta a few years ago and I've been hooked ever since. Can't wait to try this! I can't wait to give this a try! I sure sounds amazing and I have never had polenta before, so I am excited to. This was so freaking good. I LOVE how easy and delicious this is! Good idea! Now, this recipe will be one of my favorites. Great comfort food! I have to give this a try! Making this tomorrow night for dinner and we are going to love it! I just know we will! Looks like a perfect weeknight dinner! Yum! Definitely a must try!